Meet the breakout celebrity starring in our new TV campaign to free hens from battery cages! 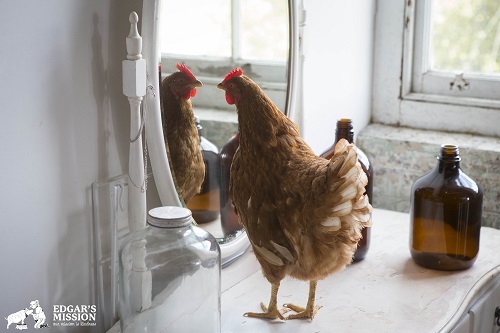 From battery hen to celebrity hen – her heart-warming story. 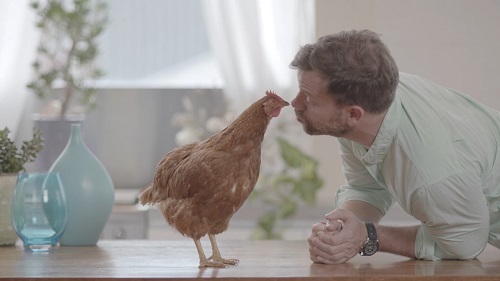 Five of Australia's most loved comedians have kindly united for our new TV ad to help spread the message that keeping hens in battery cages just ‘ain't no way to treat a lady’. But we know they’d all agree that the breakout star of this campaign is a delightful brown hen named Little Miss Sunshine! Life wasn’t always so glamorous for this lovely lady. Born only to produce cheap eggs, she spent the first 18 months of her life confined day in day out to a small wire cage, unable to even stretch her wings. The first time she saw the sky was supposed to be the last day of life — on the way to the abattoir. But this was not to be her fate, thanks to one of act of kindness and the extraordinary rescue efforts of the team at Edgar's Mission. Since then, Little Miss Sunshine's life has blossomed. She now has the freedom to explore the world and do things that bring her joy. 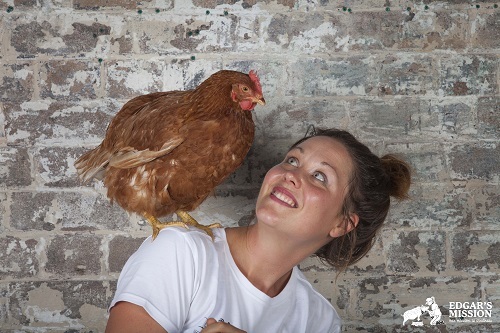 She is safe and protected, and she has become an ambassador for other hens, helping to show thousands of people through her training and skills that chickens are anything but 'bird-brained'. We sat down with her human friend, Paula from Edgar's Mission, to find out more about this amazing animal. How and when did you and Little Miss Sunshine first meet? I was a member of the Edgar’s Mission Rescue team who saved Little Miss Sunshine and 1,080 of her ‘spent’ battery hen sisters on June 8th 2013, after the man who farmed them had a change of heart and decided to exit the industry. However, Little Miss Sunshine and I did not become personally acquainted until some months later. I was actually training another very clever ex- battery hen by the name of Marilyn Monroe. Each morning Marilyn and I would go into the kitchen to practise her repertoire of tricks in the hope that one day we could share them with the world, in an effort to show people how intelligent chickens really are. But there was one obvious barrier to Marilyn Monroe becoming the new Edgar’s Mission ambassador hen – although she tolerated me when I had food, she did not (and still does not) like me very much at all! It’s just her personality – she is a bit of a diva and only likes to be petted or cuddled when it’s on her terms. But every day as Marilyn and I carried out our training, there was another hen who would just sit outside the kitchen door and watch us through the glass. She was so interested in what we were doing and would even follow us back and forth along the window as we moved around inside the house. So, having no doubt that she would be every bit as clever as my Marilyn (as all chickens are), I decided to give her a chance and we began our training that same day. And so, as they say, a star was born! Little Miss Sunshine and I have been inseparable ever since! Can you tell us a bit about her life before that? Little Miss Sunshine’s life today is in stark contrast to her first 18 months. As an egg-laying battery hen, she had spent her days within a tiny cage with three other hens, gripping tightly with long, overgrown nails to a wire floor that sloped away beneath her. This particular cage was not tall enough for Little Miss Sunshine to stand up straight, and so if she wished to stretch up to her full height, she had to poke her head through the top of the cage, meaning she then could not move around. The shed in which Little Miss Sunshine lived reeked of ammonia from the build-up of excrement inside of it. The smell was so strong that it burned my throat for days following the rescue. I can only imagine how Little Miss Sunshine felt having never left that shed for 18 long months. There was no fresh air and no sunshine in that shed. Little Miss Sunshine had never scratched in the soil, she had never bathed in the dust to keep her feathers clean, she had never laid an egg in private and her beak had been painfully cut short, which made it difficult for her to preen her feathers –- not that she had much of an opportunity to stand still and do so. There was no room for her to stretch her wings and nothing new to stimulate her mind. But I think what breaks my heart the most is that, in all that time, my beloved Little Miss Sunshine had never known joy, she had never experienced kindness and she had never been valued for who she was, rather than for what she could produce. Little Miss Sunshine getting ready for her close-up! We’ve heard she’s a pretty bright young lady – what are some of her special skills and how did she learn them? Little Miss Sunshine is bright indeed! She has a brilliant repertoire of tricks, which is growing every day. She can choose a picture of a chicken out of a ‘barnyard line-up’ when I ask her which animal she is, and she has learned to ring a bell before walking through a door. With this she shows that chickens do not just live in the present, but can anticipate the future and demonstrate self-control! Little Miss Sunshine is currently learning some more exciting tricks, which we hope to soon share with the world. In our training sessions, we use the ‘clicker’ method and positive reinforcement, which is exactly how you would train your pet dog. Little Miss Sunshine is so clever that the only challenge I have with our training is keeping up with her and coming up with new tricks! But Little Miss Sunshine is no more clever or intelligent than any other battery hen – she was just given a chance. Little Miss Sunshine charmed Lehmo during filming. How has she changed your life? Little Miss Sunshine has changed my life in so many ways I can’t even begin to count them! Even though I know she is clever and possesses such a unique personality, she continues to blow me away each and every day with what she is capable of. But I think it is Little Miss Sunshine’s journey so far that has changed my life the most – it has shown me the truly incredible power and potential of kindness. The farmer who quit the industry after having a change of heart and who wished to secure a kinder future for his hens could never have known that one of those hens would go on to be known by thousands of people around the globe. He could never have known that his one act of kindness would allow Little Miss Sunshine to touch so many hearts and perhaps make others think about the way we treat her kind. This reminds me that in life, sometimes we do not always directly see the results of our kind acts or good deeds, but that doesn’t mean they are not there. Little Miss Sunshine is my constant reminder to always be kind and to choose my actions because they are the right thing to do, not because they are the ones that serve me the most. Little Miss Sunshine gives me hope that there really is a kinder future out there for us all. 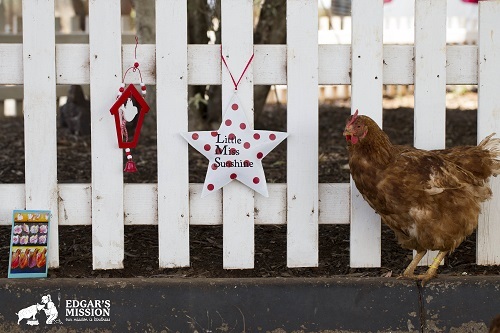 What do you think Little Miss Sunshine would like people to know about hens like her? I think Little Miss Sunshine would want the world to know that hens, just like you or me, have their own unique personalities, that they enjoy exploring the world around them, that they love to breathe in fresh, clean air, that they like to choose who they hang out with and that they adore the feeling of the sun’s warm rays shining down on their backs. I think Little Miss Sunshine would tell the world that hens like her truly love life and wish to live each and every moment to the very fullest. If she could speak, I am sure Little Miss Sunshine would say all of this is worth far more than an egg. 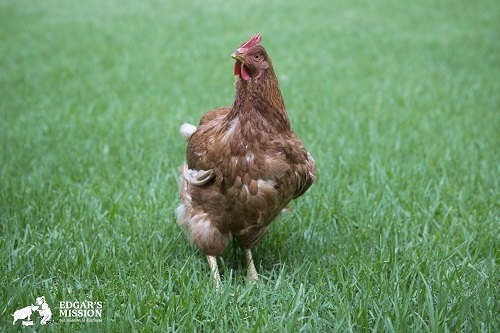 Would you like to help hens like Little Miss Sunshine? Find out how you can free them from battery cages by choosing kindly – or even by giving a loving home to a rescued hen. And click here for more amazing facts about the secret lives of chickens! Photos courtesy of Edgar's Mission.